Following is an excerpt from Chapter 10 of The Marketing Agency Blueprint. Thanks to our friends and partners at Wiley, you can download the chapter in its entirety. 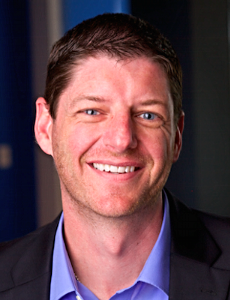 I was inspired to share this chapter after spending the week at Inbound 2013. The incredible talks we heard from Seth Godin, Arianna Huffington, Brian Halligan, Dharmesh Shah and dozens of other amazing speakers reminded me the importance of building a business that matters. While the book is written for marketing agency leaders, this chapter, in particular, is a very personal perspective that I hope resonates with all entrepreneurs. Success is not about money, or at least it should not be. We all have basic financial needs that must be satisfied, but no amount of money, fame, or power will bring happiness. In fact, my experiences have shown me that they often have the opposite effect on people. In order to find happiness, we must be a part of something greater than ourselves, something that we truly believe in. The same holds true for businesses. Although for-profit companies exist to make money, the most important organizations, the ones that have the potential to change industries and our world, are often started because the founders believe they have a higher calling. They build out of passion and an undying belief that they can create something of great and lasting significance, what others are not willing or able to. True entrepreneurs will never be satisfied with riches alone. They have to affect change and will risk everything to make their visions reality. We are programmed to set revenue goals, target growth rates, and measure our importance and value based on financial returns. We compare ourselves to industry benchmarks, flaunt our client lists, and tout our awards because they create the perception of success and make us feel good about ourselves. There is nothing wrong with having financial goals and achieving milestones, but these are simply means to an end. If you believe that your agency exists solely to make money, then you likely are falling short of your potential and cheating your employees of opportunities to realize theirs. 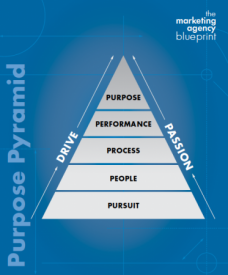 What Is Our Agency's Purpose? Have you ever stopped to ask yourself or your employees this question? You will not find the answer in the Blueprint, or any other book for that matter. Purpose comes from within, often originating with the founder, and is perpetuated through the agency’s actions and professionals. An agency’s purpose may be innate and unspoken at first, residing in the minds of its leaders. However, over time it becomes essential to involve employees. Purpose evolves as the agency and its employees mature, and their perspectives and priorities change. To recruit and retain top professionals, you must instill in them a belief that their time and energy is contributing to the pursuit of a greater goal that transcends standard business measurements and personal achievements and enriches their lives. The truly transformational agencies, the ones that will thrive and lead in the new marketing services ecosystem, will pursue purpose. Think of purpose as your agency’s compass. Purpose is not necessarily measurable, but it provides direction and meaning. Every action and decision should align with this ultimate pursuit. Purpose eases the pain of the long hours and gives you the fortitude to fail. It makes menial tasks meaningful, and serves as the pivotal piece of your employee recruitment and retention strategy. Purpose is aspirational and, in most cases, something that is never fully realized. In other words, the pursuit itself is the end game. This post is an excerpt from Chapter 10 of The Marketing Agency Blueprint. Download the full chapter nowMarketing-Agency-Blueprint-Ch10.